The Gloucester Road Central Mayfest was another big success on May 6 with huge crowds drawn to the area from mid-morning and onwards. The Golden Lion and Room 212 organised the event with lots of local community groups, food stands and creatives setting up stalls on Bishop Road, which was closed off to traffic. The Bishopston Society, Greenpeace and Avon Wildlife Trust were all represented. Bishopston Garden Society sold plants for Bristol Refugees and Lucy Clements from Golden Hill Community Garden had already helped traders tidy up and put flowers in their pavement planters before the event. Bristol Upholstery Collective told people about their wonderful workshops while Gloucester Road WI sold cakes, raising over £500 for the Hive Avon who work with people with learning disabilities. All That Glitters offered wonderful face-painting giving children beautiful intricate designs with sequins, while Playing Out organised chalk painting on the Bishop Road pavement. Local choirs Glos Vox and the Bishop Road Community choir entertained the crowd and live bands, such as The Slimline Shufflers, played throughout the day. The Eco House opened their doors and hundreds of interested visitors queued up to have a look around and talk to owner Sarah Thorp about the sustainable building techniques used on the house. They were also treated to tea and cake in the garden where the flower beds, made from recycled materials, are flourishing. Traders on the central section of Gloucester Road at the top of Pigsty Hill, spilled out onto the wide pavements, offering treats, activities and special deals to their customers. 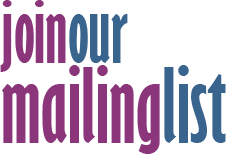 Joe’s Bakery offered biscuit decorating, Paper Plane and Room 212 had creative activities, Osna had massage tasters and Odd Sox and Roll Quick offered great discounts. Gloucester Road Central were pleased to welcome back Billie Jean's Cashmere Event and Moodles for the day. Food wise there was the Burger Theory, a barbeque at Dave Giles Butchers, Gopals' Curry shack and some wonderful toasted cheese sandwiches by Jack Benny's. Millards Sweet Treats sold out of all the icecreams from their funky little van. 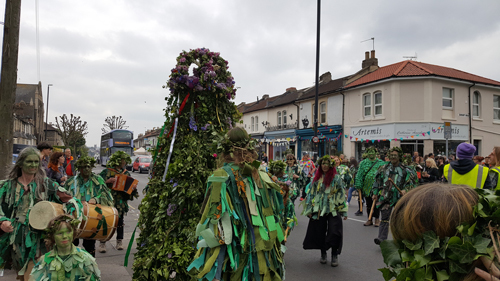 Jack in the Green, 9 foot tall in his foliage, and his merry procession of musicians and dancers arrived at up Gloucester Road at 3.45pm. They crossed over to Bishop Road and wowed the crowds with their traditional dance then went on up to Horfield Common for the ritual ceremony to welcome in summer. Meanwhile, the live music, food stalls and craft activities continue at Glos Rd Central until gone 5pm. All in all it was a wonderful day for the Gloucester Road Central traders and the whole community!